As anyone who has ever tried to sew over a denim jeans' seam knows, using the right needle makes all the difference. Using a sewing machine needle that's too thin for the fabric results in a bent or broken needle and poor stitching. When stitching by hand, a needle that's too small may not even go through the fabric. The type of thick fabric you're using also determines the type of needle that will work best. Manufacturers have designed needles specifically for wool, leather, suede, knits, quilted fabrics and upholstery. Sewing needles for both machine and hand sewing come in three basic types, defined by the type of point they have. Determine the type of needle your fabric requires before selecting the right size. The most commonly used needles are either sharp-point or ball-point. 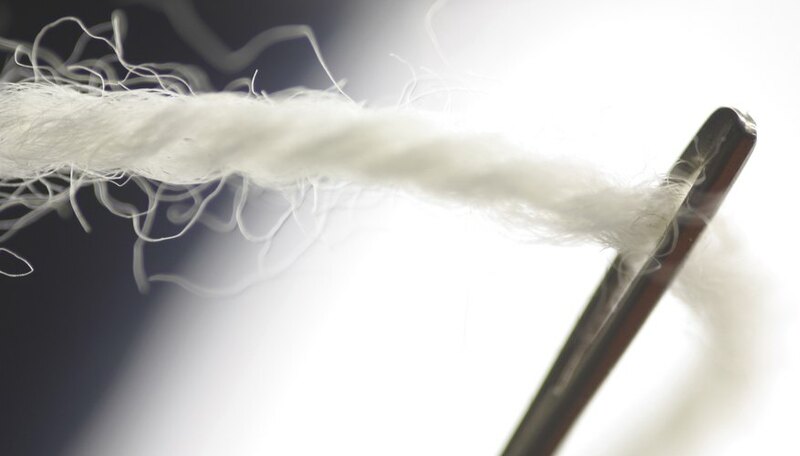 Sharp-point needles are used for woven fabrics, such as cotton, wool, taffeta and chintz, These needles make a hole in the fabric for the thread to come through. Ball-point needles are used for knits, such as jersey and double knits. These needles have a rounded point that slips between the knit threads rather than breaking them. The third type of point is wedge-point, a triangular needle used on leather, suede and vinyl. Once you have determined the type of needle to use for your fabric, you'll need to choose the right size. Thick fabrics need thicker needles. You can usually find both hand-sewing and machine needles in packages that contain an assortment of sizes, which is useful in helping you experiment until you find the size that works best for your fabric. Sewing machines for home sewing are set at the factory for sewing medium-weight fabrics with medium-sized needles and regular thickness of threads. If you're sewing heavier fabric, you'll need to switch to a thicker needle. Most sewing machine needles are labeled in both the American system, from 8 to 19, and the European system, from 60 to 120, written on the package as 16/100 or 18/110. Thicker fabrics, such as coat woolens, drapery fabric and fake fur usually require a size 16/100 or 18/110 needle size. Denim and canvas need a 16/100 needle. Sometimes you will see needles that are specifically labeled for denim and jeans. Needles for hand sewing are also sized by number, but the numbering system varies according to the type of needle. The important fact to remember when choosing a needle is that a lower number indicates a thicker, longer needle within its category. The most common needles for hand sewing are sharp-point, commonly called "sharps" or "regular needles." They are sized from 1 to 12. Carpet sharps, used for sewing through carpets and rugs, are sized from 16 to 18. Ball-point needles for knits are sized from 5 to 10.